This was poured into a stange. The appearance was a mild bright orange color with a light fizzy white head that dissolved immediately to provide no lacing. The aroma had the sweet to tart passion fruit up front a mild red cherry to oaky funk sour-ness flowing into some acidic fruit seed. 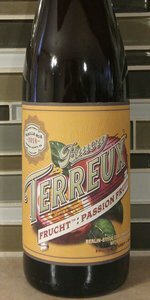 The flavor started off tart with a sturdy acidic fruitiness playing with some passion fruit seed and find it's way into a sticky funk. Good level of sour here. Mild aftertaste of passionfruit sweet tartness with it's seeds. The mouthfeel was between light and medium bodied with a fair sessionability about it. Nice sour pucker on my tongue with a mild stickiness. Damn nice passionfruity tart grab on the finish. Overall, seemed more of a tart/sour-ed fruit beer, but very well done. Where's the sour-ed wheat? Still, it's one I'd come back to for me. A - Pours a lightly hazed golden orange with a two finger fizzy white head. The head fades quickly leaving no lacing. S - Aroma is pale wheat, straw and passion fruit. T - The taste is tart passion fruit, green apple skin, lemon, lime, white vinegar, wheat and light yeast. M - Light to medium bodied with medium carbonation. Soft mouthfeel with a crisp dry finish. O - This is a solid fruited Berliner. The flavors are clean and refreshing. Very nice for a warm afternoon.